For the 12000 years of the Holocene period, as the earth came out of the last Ice Age, entered a period of great stability which benefited humankind greatly. The ascendance of Homo Sapiens in this period was because of the stability of the environment, which in turn enabled settled agriculture to evolve and support large populations. In this evolution, Sri Lanka was in the vanguard. Artifacts unearthed in our pre-historic settlements indicate that even as far back as 37,000 years ago, the conditions that favoured the rise of humankind was found in this small island nation. Skeletal evidence of the “Balangoda Man” and geometric microliths found around the settlements where the “Balangoda Culture” prevailed point to an established agrarian civilization. This indicates that Sri Lanka is one of the crucibles of human civilization and can tell us much about how human society evolved on earth. Sadly, we do not know too much about the prehistoric conviviality of our people. Scientific pursuit is important to understand human-nature coexistence that prevailed in these times and I am sure that there is a considerable amount of paleo-ecological evidence waiting to be discovered on this island. The conditions that led to the birth of our irrigation and hydrology-driven civilization will, I am sure, provide much food for thought in shaping our future too. However, I must stress that science is not just about wallowing in the nostalgia of a glorious past. I believe that we must use it as an enabler to chart our shared destiny in an inclusive and sustainable manner. It is a great pleasure indeed to welcome all participants to the first Science and Technology for Society Forum in Sri Lanka (STS-SL 2016) and, at the outset, permit me to thank the individuals and institutions whose untiring efforts have enabled this to happen. I must also commend Hon. Susil Premajayanth for all the efforts he has put in to make this forum a success. He accompanied me to Kyoto last year and the discussions we had there was the beginning of this successful forum. I do hope it will become a regular feature in our calendar of events as we shape the future of our nation and its peoples. I also hope that this will be a forum not restricted to Sri Lanka but would also in the future serve as the forum for this region, South Asia. I am also happy to have with us, today, Hon Koji Omi, former Finance Minister and Science and Technology Minister of Japan and Chairman of the Science and Technology in Society, or STS Forum. He has been an inspiration to the peoples of the world in promoting science and technology in society through the modality of the annual STS Forum in Japan. Set in a spectacular location in Kyoto, Japan’s ancient royal capital, and held in the splendor of the Japanese autumn, the STS Forum is indeed the Science and Technology equivalent of Davos Forum. I too was inspired when I was invited to speak there last year and this event, here in Sri Lanka today, has its roots in that visit. Mr. Omi, I thank you for the presence of your STS team and, also, for inspiring Japan to send this year two very large science delegations. The first of these was for the Asian Science Councils Conference, which Sri Lanka hosted in May, and now, a large 46 person delegation to this Forum and its associated events, organized by the Ministry of Science, Technology and Research and the Prime Minister’s Office. These are the first steps in formulating a National Science and Technology policy and the connected plans and Programs. Needles to say this will also require us to focus on the first time on the role of Science and Technology will play both within Sri Lanka itself and within the region. Science and Technology is one subject like cricket which can bridge the region together. 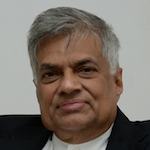 Sri Lanka plans to achieve the status of high income economy in the next two decades. The rapid economic development required to achieve this goal depends on innovation and the promotion of Science and Technology. Therefore, the Ministry of Science & Technology has the lead role to ensure and establish a strong science and technology base in Sri Lanka. As well as to mobilize the expertise both foreign and local needed to prepare this plan. Sri Lanka is turning a new page in its history. Inclusiveness, sustainability and greater engagement with international society, all symbolized in the agenda of this Forum, are the three pillars upon which we plan to build our future. Harmonious coexistence is at the core of inclusiveness and Sri Lanka has to re-learn that diversity is not divisive but can unleash the full potential of the creative human spirit. The coexistence of human society and nature in an era which Nobel Laureate Paul Crutzen has termed the “Age of the Anthropocene” calls for responsible human stewardship of the earth. I am happy to tell you that Sri Lanka has embraced the 17 Sustainable Development Goals, SDGs, as central to its national development strategy. Science and technology-driven innovation is the enabling force we hope to mobilize for this endeavour. It is thus important for Sri Lankan society to have a broad awareness of the importance of science in shaping our destinies. Unlike in the Holocene, where the earth’s average annual temperature fluctuation was between plus/minus 1 degree Centigrade, stability is unlikely to reign. It is ironic that today’s instability is of anthropogenic origin because Homo Sapiens’ ascendancy was a result of a stable environment on earth. Today, with our greenhouse gas emissions, we are increasing the temperature fluctuation to around 2 degrees Centigrade, whilst many scientists fear that the resilience of the earth’s life-support system may be threatened if the range of fluctuation is not kept to around 1.5 degrees. In order to do this, we will have to recognize what Mother Earth, our crucible of life, will allow us to do and what is absolutely impossible. This last brings to my mind the Gandhian quote…” the earth can provide for Man’s need, but not for Man’s greed”. We need to reshape our lives and livelihoods to fall within what researchers at the Stockholm Resilience Centre call a “safe operating space for humanity”, after quantifying “planetary boundaries” for nine areas of threat. The analysis of each area tells us if humankind is in a zone of “safety”, “uncertainty” or “danger”. While climate change is in an area of “uncertainty”, sadly, for two of these nine areas, namely for loss of biological diversity and the cyclicity of bio-geochemicals (particularly Nitrogen and Phosphorus) we are in the “danger” zone. This danger zone implies that we are soon to enter what is called a “tipping point”, when a dramatic irreversible change will take place. In such a new regime, we do not know if humankind will benefit greatly or if it will drive us to mass mortality and possibly extinction. Following the “preventive principle” I believe that we should respect these planetary boundaries and I urge Sri Lanka’s scientific community to address such issues. We are beginning to feel the adverse impacts of neglecting to protect the land cover on our hills, the rich habitats of our wildlife and the hydrological management of our river basins and flood plains. The highlands to the south of our central hill, home to our fabled Uva teas, are showing dramatic signs of land degradation. In the Knuckles Man and Biosphere reserve, designated by UNESCO, we are beginning to see rill and gulley erosion around the settlements of its buffer zone. With the disappearance of drizzles characterizing the hills of Nuwara Eliya, we see a less dramatic but just as profound change in our hydrology. I am told that this gradual drying up could well cause a shortfall of water in our longest river, the Mahaweli, by as much as 30 per cent. It is certainly beginning to change the leaf content of our high polyphenol Nuwara Eliya teas as cellulose increases proportionately to counter this drying effect. We need to counter these trends where we can and adapt them where we cannot with foresight and advanced planning. For this, science and technology are imperatives. In this quest for solutions, we must not forget to uplift the human condition, as stressed in the 17 Sustainable Development Goals. To chart the new paradigms this calls for, science must strive for excellence. Here in Sri Lanka, we need to establish a “research culture” in our institutions of higher learning. I am mindful of the sentiments, expressed to me by young Sri Lankan postgraduate students and post-doctoral fellows whom I met while travelling abroad, that this is lacking in our country today. Having talked to our scientists, many of whom are dedicated to societal betterment through the introduction of science and technology, although the spirit is willing, our research infrastructure is yet quite weak. To be at the frontiers of science and technology, quality instrumentation needs to be purchased or developed and deployed with strategic intent, accessible to a broad base of young talent, gently guided by mature minds. To house this, we need to establish a dedicated national institution of advanced studies for science and technology, benchmarked with the world’s “best and brightest”, where excellence is rewarded. Academia Sinica was established in Taiwan by Professor Lee Yuan Tseh, Nobel Laureate in Chemistry, who has visited Sri Lanka in the recent past, to address this issue in the fundamental sciences. Similarly, in Japan, the Okinawa Institute of Science and Technology (OIST) was established by Hon. Koji Omi, in collaboration with Dr. Akito Arima, former President of Tokyo University and Minister of Education. Dr. Sydney Brennar, Nobel Laureate in Medicine and OIST’s first President, and a whole cast of Nobel Laureates helped in the launch of OIST. I am happy that Dr. Robert Baughman, Vice-President of OIST, who worked hard towards its establishment, is here to share this experience with us today. The Ministry of National Policy and Economic Affairs together with the Ministry of Science, Technology and Research, will prepare proposals for a Central Institute of Science and Technology, following the example I have referred to in my speech. Our Universities and Research Centers will have the opportunity of being affiliated with the CIST. Furthermore our national policy is based on the expansion of science and technology education in the school system and the universities, the strengthening of research development of private and public sectors. This calls for more Science and Technology Teachers and Academics. The concerned Ministries are now addressing their minds to preparing a report as the first step. The quality of our science and technology developments will ultimately depend how successfully we can broad-base these endeavours. I notice that you have “Citizen Science” in your programme of discussion and welcome its inclusion. We need to have the same levels of enthusiasm that a music concert a cricket match or the Galle literary festival generates among the public in the field of science too. A national Science Center initiative, with spectacular outreach even to the remotest parts of Sri Lanka is needed to engage our citizens in science, to foster young minds in our schools, and to advise on how our pedagogy might be reformed. The revision of the science curriculum in our schools and improvements to their laboratories are called for and an open science initiative which partners with the international community is called for in this era where globally significant issues of the kind I have mentioned earlier need to be addressed urgently with creative local enterprise. (5) Civil safety on land, sea and in the air, including disaster risk reduction and vastly improved hydrology management. I hope your discussions at the Forum will shed light on how science and technology can help us achieve these ends and inspire Sri Lankan entrepreneurs and industrialists to invest in science. I earnestly hope that your engagement in this Forum will lead to collaborative endeavours and lasting friendships beyond our borders, mobilize your collective wisdom to overcome pressing challenges and help steer our country along a path that future generations can proudly walk along. In this context, I am extremely grateful to the Government of Japan for including Sri Lankan youth in their training of young scientists under the “Sakura Science programme”. I have received similar offers of assistance during my recently concluded visit to China and Singapore. I thank the Governments of Japan, the U.K. and the Federal Republic of Germany, among others, for sponsoring large delegations of stellar scientists to inspire us here in Sri Lanka. May I request your continued support to nourish and nurture our own community of scientists in universities and research institutions, as well as the “would-be scientists” in our schools. Economic Policies Of Parakramabahu, The Great: What Lessons Are There For Today?